Super Mario continues to be one super iconic character that people old and young love. Planning a Super Mario Party was so much fun for me, and it was also my most labor intensive party I have ever done, and sadly I spent so much time trying to make it all perfect that I didn’t take enough pictures. I don’t want this to happen to you, so I am going to tell you how to plan a great Super Mario Themed party that won’t leave you exhausted! Nowadays, pre-made invitations are easier to come by, but if you want something cute and easy, here is what I used when I printed out invitations for my kids’ friends. After I sent the invitations, I came up with a way to turn this party into a live action version of the games. Seeing as how I am kind of geeky and love all of the Super Mario games, I had a lot of fun with this. I set up levels of the house and yard to be like levels of the game. I had the kids gather in the car port. I had an activity “planned” for the kids to start. However, before the kids could start the activity, my husband appeared dressed as a “Boo” ghost, and he whisked all our activity supplies away! In order for the kids to be able to do the activity, now they had to play a live action version of Super Mario with the set up I created in my yard and house. I wanted the car port to be Princess Peach’s Castle, but I could not find any castle scenery. Instead, I took a page from Super Mario Sunshine and turned the car port into the vacation spot from the beginning of that game. It looked very beach-like. As for the backyard, I turned that into Yoshi’s Island, complete with a Welcome Poster of Yoshi and Flying Fish cutouts.We started at Yoshi’s Island and played Musical Islands. Basically, it is musical chairs, but instead of the chairs, make some cardboard cutouts of islands. Unfortunately, we do not have a large backyard, so I used green and yellow bucket chairs I had. The best part is that the kids also played drum circle with them later in the afternoon! We had a rather large group, so we played two rounds. At the end of each round, the winner was given a gold star. Some of the Super Mario games involve collecting stars, so the kids were excited about it. Next we entered the house towards the basement for Boo’s Mansion. For Boo’s Mansion, I cut out pictures of Boos and made posters that said things like, “Turn Back Now” and “Do Not Enter, especially Mario.” The key is to make the signs look like they are supposed to be scary, but make sure to mis-spell some of the words to make it more Boo like. Once down there, we played a variation of Red Light Green Light. I held a Boo ghost I printed. When I turned around, they could move freely, but once I turned back, they had to freeze. Whoever moved was out. The last person received a star. After that game we went through my kitchen/dining room. I had it decorated in cutouts of the question mark blocks, goombas, koopa troopas, power-up mushrooms, fire flowers, and tunnels (aka a sewer passage). The last one through got a star. Once through the tunnels sewers, they reached the living room which I turned into the Shy Guys’ Toy Box. The Shy Guys’ Toy Box was decorated with Shy Guy Cutouts. I used my son’s old Geotrax train system to have running throughout the living room. For that level, we played Hot Potato. To do this game, you can use a black balloon (Chomp-Chomp) as the potato. After the game, I gave out another star, and we headed upstairs where I had the third floor decorated as Bowser’s Castle. On the way up to the second floor and third floor, cutouts of Chomp Chomps and Bob-ombs decorated the walls. Once they got to Bowser’s Castle, they discovered Chomp Chomps (black balloons) all over the floor. The first thing they had to do was to pop all the Chomp-Chomps. We had over two dozen on the floor! Then they had to defeat the boss. For that game, we played a version of Pin the Tail on the Donkey: Put the Fireball on Bowser’s mouth. After they “defeated” Bowser, they got the supplies for our craft activity, had their cake, and played with friends. Super Mario Cake Made by a Friend! 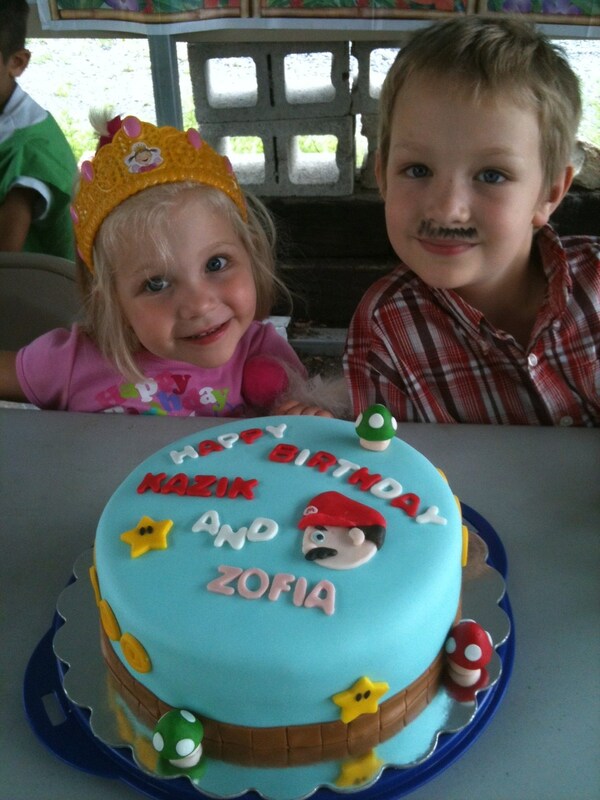 For refreshments, we had Koopa Tea (fruit punch) and fresh veggies and fruits., and our friend made us a super cute Super Mario cake! As for the decorating, I looked up Super Mario Images on Google and printed them, cut them out, and posted them everywhere. I purchased beach theme decorations at a local party store, and I used tableware in bold, primary colors. Author’s Note: I originally wrote this when the Big Kids were turning 4 and 8 back in 2011. They will be 13 and 16 this year. I went back through and did some editing as this is still one of the kids’ favorite parties. I hope you enjoyed my walk through, and if you do this party, please feel free to share what you loved and how it went! Great ideas. I like that cake. My daughter would love a Mario party.